For robots operating in man-made environments, the ability to climb stairs is essential. Especially for vehicles used for emergency response (e.g., to search for victims in a building), fast and reliable stair-climbing is necessary for mission success. Teleoperation, which is currently the standard mode of use for search-and-rescue robots, is not an appealing option when it comes to climbing stairs. Usually the robot maneuvers outside the field of view of the operators, forcing them to rely only on visual feedback from the robot. However, images from the robot's camera are often blurred due to the robot's motion, have limited field of view, and are subject to latency, due to the communication channel. These factors, combined with the robot's slippage on the stair edges, can result in inaccurate and slow stair climbing, collisions with the stair walls, and even in toppling of the vehicle. The algorithm has been implemented on iRobot Packbot (shown above), and has demonstrated robust performance under real-world conditions. The key factors contributing to the algorithm's reliability are the high rate at which attitude estimates are produced (100 Hz in our implementation), and the fact that no assumptions about the stair geometry, the dynamics of the vehicle's interaction with the stair surface, or the lighting conditions are imposed. As a result, the system is capable of robust operation in challenging situations. 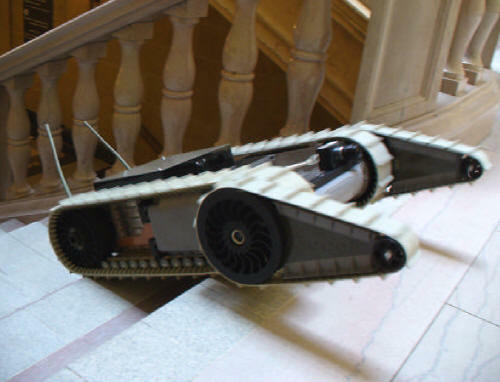 Owing to its generality, the developed stair-climbing algorithm can be implemented on any tracked vehicle that is equipped with a 3-axis gyro and a camera, and can be employed on robots used in search-and-rescue missions and military operations, to increase the mobility of handicapped people, or to improve the efficiency of household-helping robots. One of the most challenging tests of the stair-climbing algorithm took place at the Tampa Police and Fire Training Academy, in Tampa FL. During the Spring 2005 NSF Industry/University Cooperative Research Center (I/U CRC) on Safety, Security, and Rescue Research (SSRRC) Spring 2005 Symposium, the robot was required to autonomously climb the outdoor metal staircase of a fire tower. This flight of stairs was very steep and slippery, due to wear of the steps' color coating. Despite these challenging conditions, the robot was able to overcome the extreme slippage, and to safely reach the top of the stairs. The detected straight lines are superimposed on the video images. Note the severe slippage and jerky motion that the robot undergoes in the initial phase of the climb. In spite of the very fast dynamics of the motion, the controller is able to securely guide the robot up the stairs, due to the high bandwidth of the attitude estimates. The sensor modeling-based design of the estimator makes it independent of the particular robot used in an autonomous stair-climbing application. The implemented EKF estimator can be ported on any wheeled, hybrid, or legged robot such as humanoids equipped with a camera and gyroscopes to provide precise estimates for the robot's attitude and the distance ratio from the staircase boundaries. C2. A.I. Mourikis, N. Trawny, S.I. Roumeliotis, D.M. Helmick, and L. Matthies "Autonomous Stair Climbing for Tracked Vehicles", International Journal of Computer Vision & International Journal of Robotics Research - Joint Special Issue on Vision and Robotics, Aug. 2007 (to appear - pdf). This work was supported by the University of Minnesota (DTC), the Jet Propulsion Laboratory (Grant No. 1251073, 1260245, 1263201), and the National Science Foundation (ITR-0324864, MRI-0420836). Joel Hesch, Le Vong Lo, Faraz Mirzaei, Kyle Smith, and Thor Andreas Tangen offered their invaluable support during hardware/software development and experimental testing and validation.